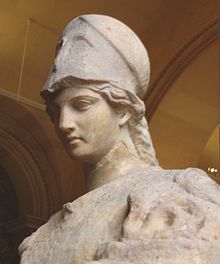 Athena (Attice: Ἀθηνᾶ vel Ἀθηναία, Ionice: Ἀθήνη, Dorice: Ἀθάνα, in poësi epica: Ἀθηναίη) est in mythologia Graeca virgo dea quae artes bellumque curavit, Metidis et Iovis filia, cuius ex capite vivens orta est. Etiam Pallas Athena (Παλλὰς Ἀθηνᾶ; Παλλὰς Ἀθήνη) et, quod patrona urbis Athenarum venerabatur, Athena Polias (Ἀθηνᾶ Πολιάς, "Athena urbina") appellatur. Et urbi Athenarum et deae Athenae idem nomen est. Athena etiam callida heroum comes est; apud Romanos ei Minerva aequatur. Dea virgina habetur, ex quo Athenienses templum Athenae in Acropoli dedicatae Parthenon (Παρθενών), deam autem Ἀθηνᾶ Παρθένος appellavere. ↑ An dea nomen ab urbe traxerit an urbs a dea antiquitus disputatur, vide: Walter Burkert (1985), Greek Religion (Cantabrigiae Massachusettae: Harvard University Press, ISBN 0-674-36280-2), 139 (Liber primo Theodisce nomine Griechische Religion der archaischen und klassischen Epoche anno 1977 Stuttgardiae editus est, tum in linguam Anglicam conversus). ↑ Susan Deacy et Alexandra Villing, Athena in the Classical World (Lugduni Batavorum: Koninklijke Brill NV), 2001. Novissima mutatio die 31 Martii 2018 hora 23:21 facta.